For the graduation party last month we did lots of little desserts in mason jars. Here’s my absolute favorite cake recipe from the party, from the soon-to-be-released cookbook Desserts in Jars: 50 Sweet Treats that Shine . Bonus: it’s gluten free! Preheat oven to 350 degrees F. Butter insides of 12 small mason jars. Over a double broiler, melt chocolate and butter together. Set aside. Let cool until it is cool enough to touch without burning you, 15 minutes or so. Beat egg whites till stiff peaks form. Set aside. In an stand mixer combine sugar and egg yolks and beat til thick and creamy. Add 1/4 cup of warm chocolate to egg yolk mixture. Continue to mix, slowly adding rest of warm chocolate mixture until all is incorporated. Fold egg whites into chocolate mixture. Divide batter among the 12 jars, about 1/4 cup per jar. Place 2 inches apart on large baking sheet. Bake 25-30 minutes,until tops of the cakes begin to crack. Remove from oven and let cool, dusting with powdered sugar once cool. Serve warm or at room temperature. Pinning! 😀 They look scrumptious – thanks for sharing. Can’t wait to make these myself. Yum! These look amazing. My oldest daughter saw the pic and said she’d love to be eating one of those right now. Yay! Gluten free! My little 7 yo gluten free girlie would probably love to try these. My favorite part is how they are packaged to go. She could take one to the next party she goes to. Do you use the 4 oz canning jars for these? I used mostly 8 oz, but they were not very full. I think the 4 oz would work fine too. Summer, I doubt it. Since this cake is wheat free, the eggs are basically providing the structure of the cake. Maybe another recipe would work.. This looks delicious. Planning to try to make it for some gluten free friends who invited us to dinner. Do you think I could just do the recipe in a 8x 8 or 9x 13 pan since I don’t have enough jars? 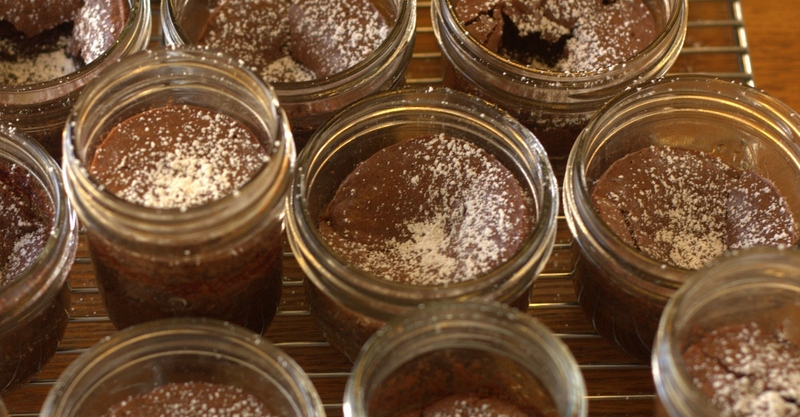 Can the baked cakes in the jars be frozen for later use? Absolutely, yes– just let them cool uncovered before freezing so they don’t sweat too much.